In May 2008 I was in an opportunity to have a look here. 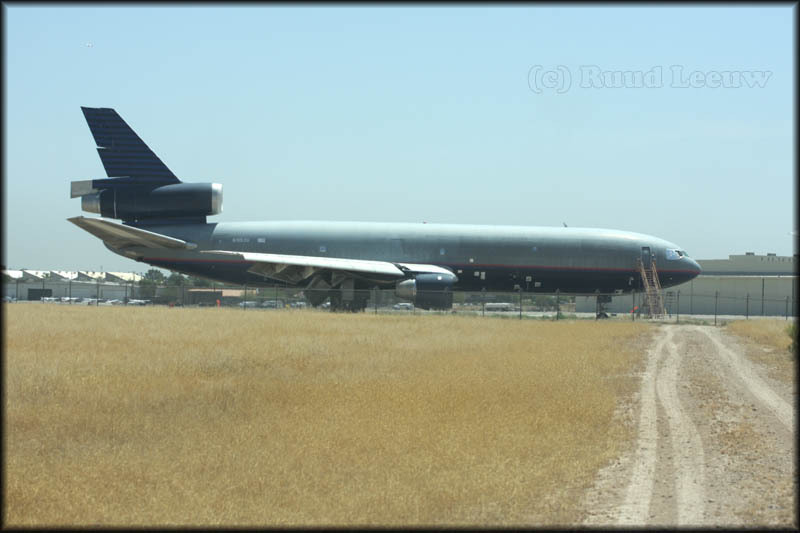 My main interest was the Douglas DC-7 in long term storage, but I drove along the fence and found quite a selection of jetliners stored here. 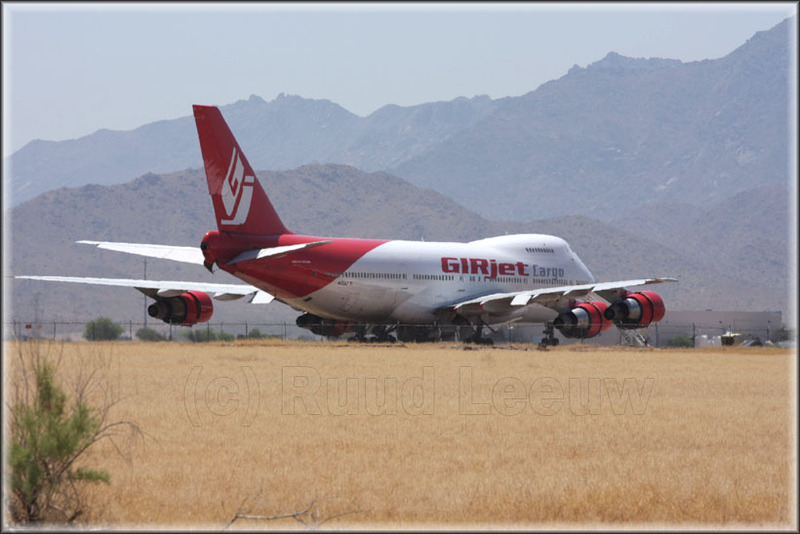 GirJet intended to expand into the cargo business and aimed to acquire 2 747-200F's from Martinair (PHMCE & PHMCF). 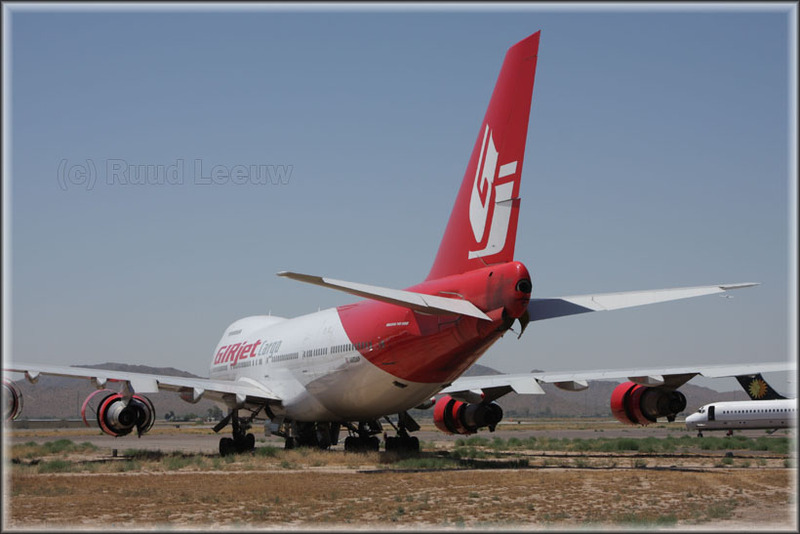 Flightcrew trained on Martinair's route net. And indeed PHMCE was purchased and reregistered EC-KEP. 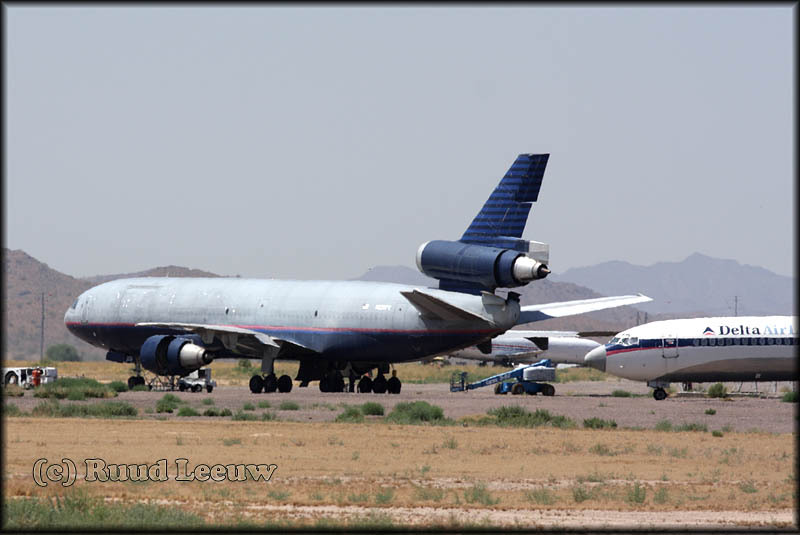 EC-KEP was reregistered N652AP (AWAS) and is seen here stored in the Arizona desert: Goodyear Airpark, Phoenix (19May08). 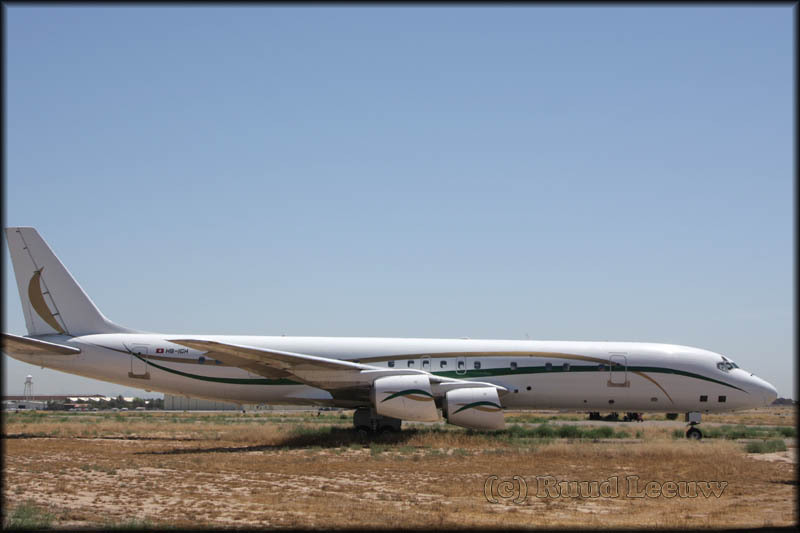 During 2009 this 747-200 was registered to a new startup in Pakistan, Rayyan Air, with tailnumber AP-BIB. 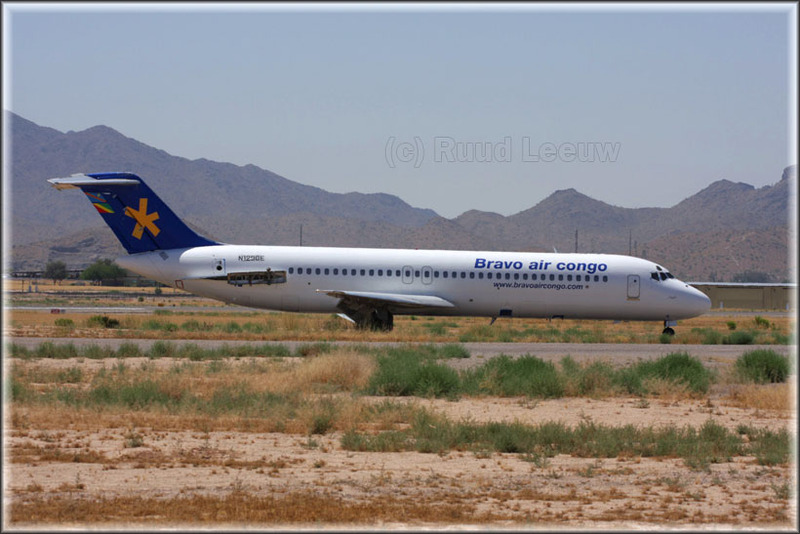 DC-9-32 c/n 48129 is seen here stored at Goodyear Airpark on 19May08 with the titles of its last operator: Bravo air congo. 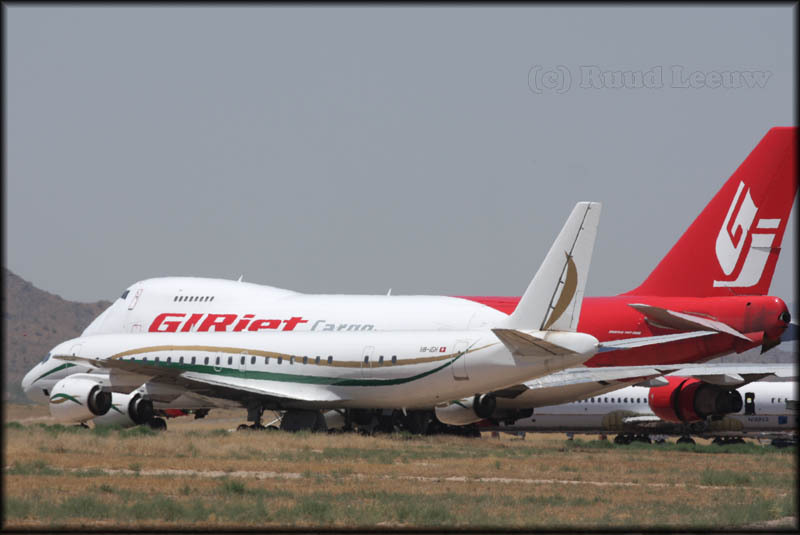 Now registered to JETRAN LLC, tailnumber N129GE has been applied rather crudely. 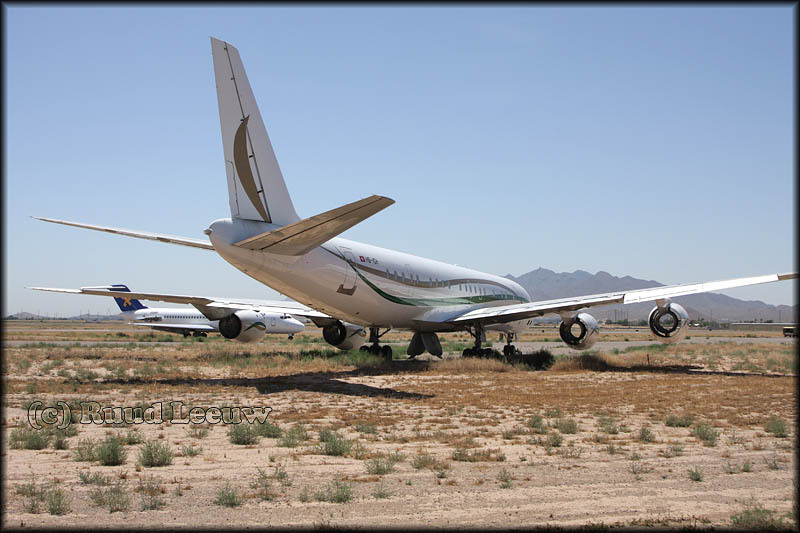 Before it became a part of the City of Phoenix airport system, Goodyear was known as the Goodyear Municipal Airport. It had a long history of military service. In 1941, with World War II raging in Europe, the Goodyear Aerospace Corporation offered land to the U.S. Defense Plant Corporation. The U.S. Navy used the land to build aircraft flight decks and established a U.S. Naval Air Facility to test fly and deliver aircraft. This necessitated the construction of a landing field, hangar and runway. After the war ended, the naval facility remained operational to preserve and store aircraft from 1945 to 1965. At one point, more than 5,000 aircraft were in storage. The Korean Conflict brought the airfield back to active duty in the fifties. At the end of the conflict, the facility was decommissioned. 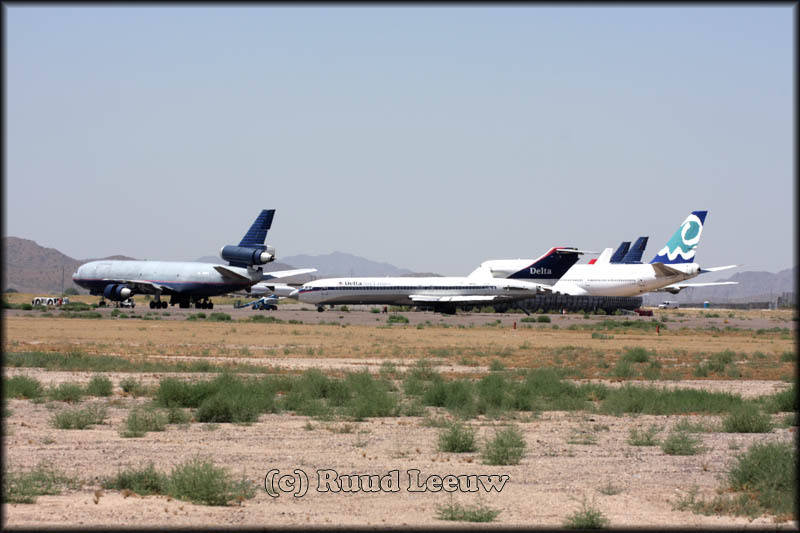 The majority of remaining aircraft were moved to Davis Monthan Air Force Base in Tucson and the U.S. General Service Administration put the entire 800 acre site on its surplus list. 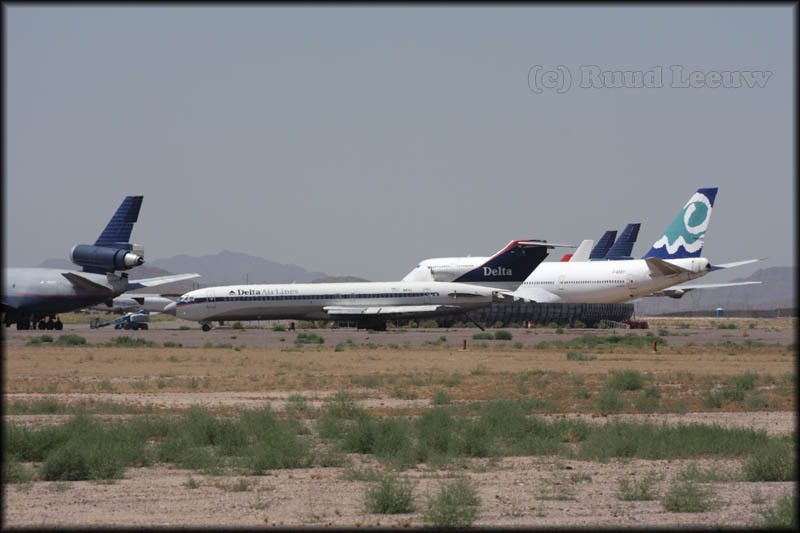 In 1968, the City of Phoenix purchased the property as an alternative airport to Phoenix Sky Harbor. A master plan was crafted for the airport in 1986 that called for a new terminal building, hangars and support facilities. To date, Goodyear Airport's improvements have included a new terminal, T-hangars, ramp space, tie downs and an airport maintenance facility. On the programme they did their best to camouflage the last operator and reg number, but in fact it was N831L. They painted over the operator markings and replaced the final L with a 1. 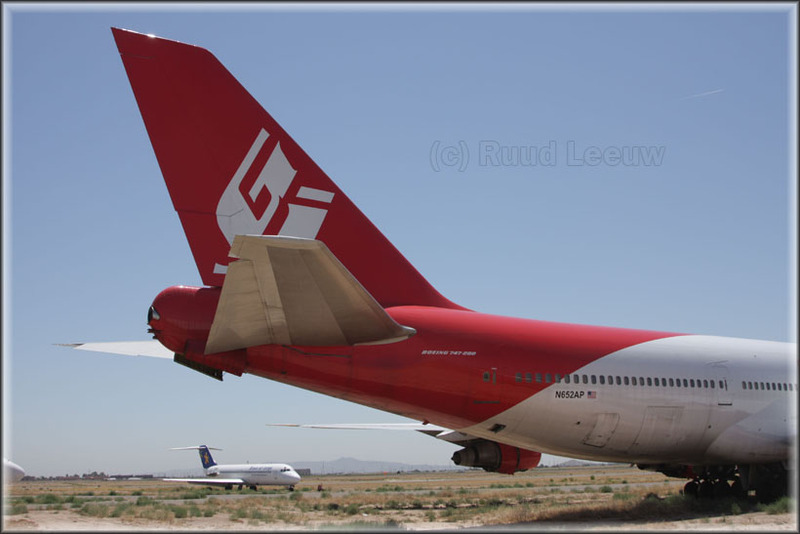 I then googled N831L and aside from a few photos on jetphotos.com came across a match on your site. Other research points to a US programme. Sunday Apr 25 2010, NatGeo will premiere a series called, 'Cut It In Half'. 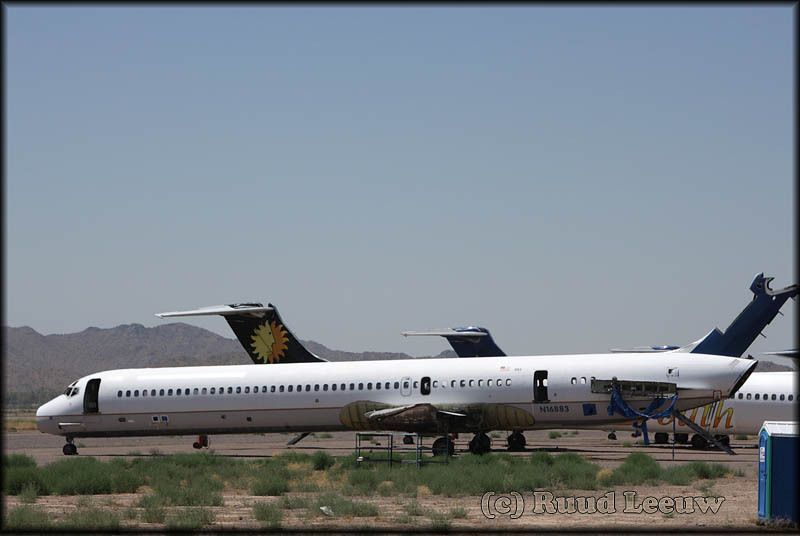 They will dissect a 727 in order to show the public just how sturdy an airplane is! So I guess we get Nat Geo over a year after! 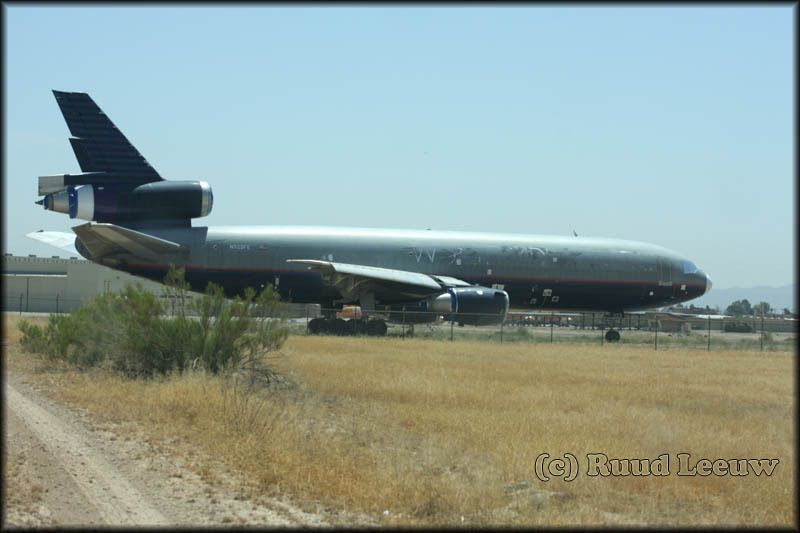 N326FE is a McDonnell-Douglas DC-10-30(F) with c/n 47813/312, owned by FedEx Express. B-2811 returned to service, with Santa Barbara Airlines (as YV304T). It was ferried GYR to Miami-KMIA on 05Jun08. 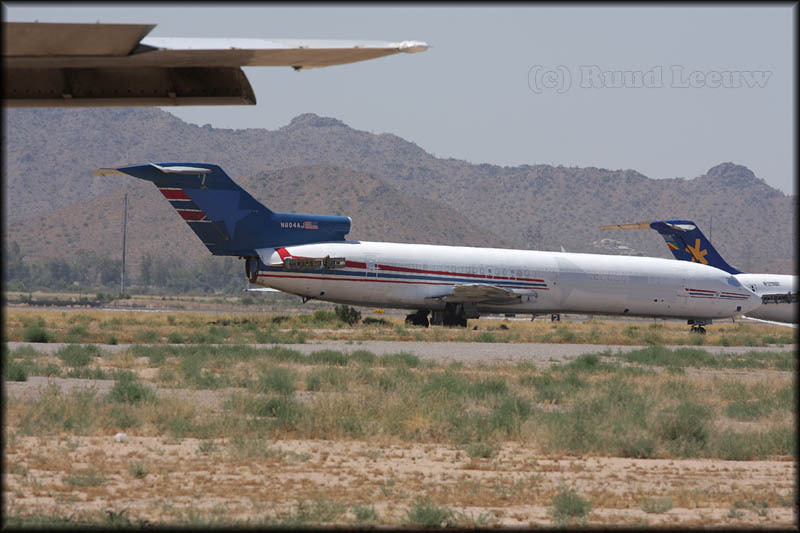 Boeing 727-2D3(F/RE) N804AJ (c/n 21021/1082) of Amerijet Int'l is not going anywhere anymore..
McDonnell-Douglas MD-81 N16883 (c/n 48073/1018) is quickly loosing its parts. 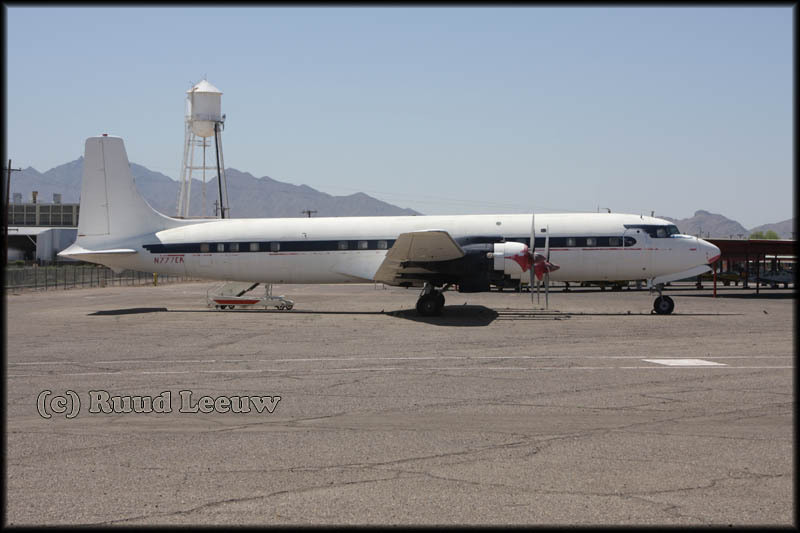 DC-7C N777EA (c/n 45549) has been stored for a long time. This is former KLM Royal Dutch Airlines PH-DSR. Peter ten Duis sent me photos in 2006 and I have included its history with it on: Guestphotos page 2. Unfortunately, the news then, about restorations, seems false hope. However... the saga continues on this aircraft! Adrian Stanislovaitis was aboard N777EA and he met Mr. Robert Mosely. Yes, as of 17Feb09, they still have plans for restoration! And there was someone from a religious group on board. 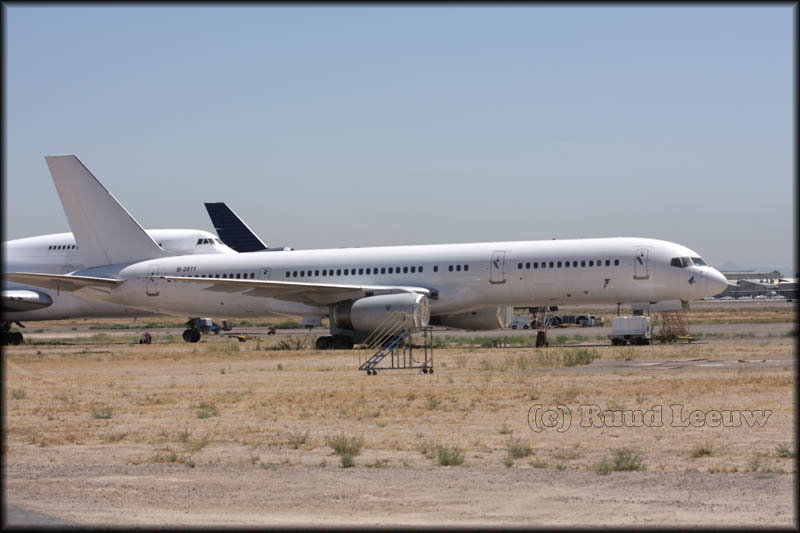 A rock band from Chicago has contacted them about purchasing the aircraft, and restoring in for their personal use and tours, but the current owners would like to restore it and use it on missionary flights... So, who knows?